Honey is a pretty amazing substance and there is a lot more to it than just a sweet tasting treat. Honey plays a crucial role in the life of a honey bee and can also be very beneficial to the human body. We invite you to learn more about honey and bees and how they can enrich our lives. Raw honey vs Other Honey? There are over 25,000 species of bees worldwide. An adult worker bee’s lifespan is between 30 and 45 days during summer months. A typical Bee colony consists of 30,000 to 60,000 bees. Male bees are called “Drones” and they do not have stingers, their only purpose is to mate with a virgin queen bee from a different colony. A queen bee can sting multiple times without dying. 99% of the bee colony is made up of female bees known as worker bees. The average honey bee’s wings flap over 183 times per second. Bees have an excellent sense of smell which allows them to find their hive. Honey Bees actually dance when they return to the hive to tell the other bees where the flowers are, the dance is called “The Waggle Dance”. Honey is the ONLY food source produced by an insect that humans eat. Worker honey bees transform the floral nectar the gather into honey by adding enzymes to the nectar and reducing the moisture. Honey is much more than just a simple sugar. Rich in minerals and nutrients, honey also has some antibiotic properties that may aid in the healing process. 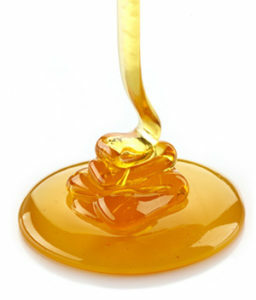 For thousands of years honey has been used by mankind in many capacities to help give the human body energy and health. Below are the nutritional facts for Honey. The National Honey Board has done extensive study and research about the history, nutrition and medicinal properties of honey and have compiled huge resource of information. For more information about honey, please visit the National Honey Board website. Honey is a supersaturated sugar solution with approximately 17.1 percent water. Fructose is the predominant sugar at 38.5 percent, followed by glucose at 31 percent. Disac- charides, trisac -charides and oligosaccharides are present in much smaller quantities. Besides carbohydrates, honey contains small amounts of protein, enzymes, vitamins and minerals. Honey is known to be rich in both enzymatic and non-enzymatic antioxidants, including catalase, ascorbic acid, flavonoids and alkaloids. Although appearing only in trace amounts honey also contains about 18 different amino acids. Crane, E. 1976. “Honey: A Comprehensive Survey,” Corrected edition. International Bee Research Association/Heinemann, London; Berenbaum, M., Robinson, G. and Unnevehr, L. 1995-1996. Antioxidant properties of Illinois honeys. University of Illinois. Each variety of honey has characteristics that make that each one unique. Some of the main characteristics are color, granulation, moisture content, Levlose (fructose sugars) levels and Dextrose (glucose sugars) levels. Honey color is always graded with a number. A low number indicates a light color and the higher the number the darker the honey. Granulation is also given a number value to rate at which point the honey tends to crystallize or granulate. Levlose, dextrose and moisture levels are based on a percentage. Honey that is sold as raw contains all the pollen, enzymes and other micro-nutrients that are usually filtered out or destroyed by heat when the honey is processed. 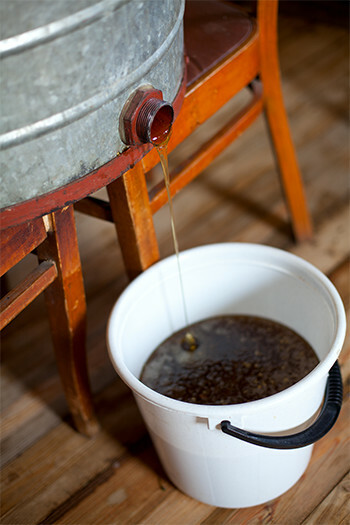 Traditionally, honey is heated and filtered so that it will remain liquid much longer. Raw honey will crystallize quickly due to the fact that it is unfiltered. 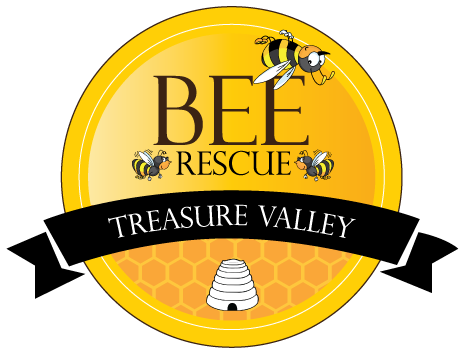 Treasure Valley Bee Rescue offers several varieties of raw honey, which are never heated above 115 degrees. Many people believe that raw honey contains additional health benefits over traditionally processed honey. Honey has been used for everything from skincare to mead (honey wine). Honey is widely preferred as a sweetener because it is also a flavor enhancer. The wide variety of flavors available from different honeys makes honey a gourmet’s delight. If properly stored, honey will not spoil: A pot of honey found in an ancient Egyptian tomb was proved to be as wholesome as fresh honey. However, honey will ferment if it is diluted by moisture from the atmosphere or by other liquids. Prevent fermentation by keeping honey containers tightly sealed before and between uses. Honey should not be consumed by infants under one year of age or those with a compromised immune system. Replace 1 cup of sugar with 3/4 cup of honey and reduce the liquid in the recipe by ¼ cup. Add a pinch of baking soda to recipes that do not call for sour cream or sour milk, so as to reduce the acidity of the honey. Cook jellies and jams at higher temperatures when you replace sugar with honey. Beat honey candies longer, and seal them more tightly when storing them to keep the honey from absorbing atmospheric moisture. 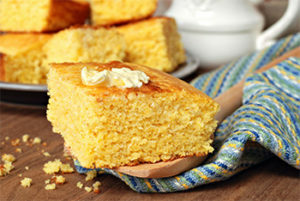 When baking with honey, lower the oven temperature by 25° to 30° F to prevent over-browning. When measuring honey, first coat the measuring utensil with a small amount of oil so the honey will not stick. Store honey at room temperature rather than in a refrigerator. Keep it tightly covered and in a dry place. If honey granulates, place its container in hot water until the honey re-liquefies. Honey, because it is Hygroscopic, tends to keep foods moist and tender. Therefore, if you are baking goodies for kids away at school, service members overseas, or friends out of town, always bake with honey to ensure freshness. Is defined as a natural occurring process of honey that changes it from liquid to solid. Some people think the honey is spoiled as it crystallizes but according to the chart, crystallization in honey occurs when the honey molecules are at optimum temperature. It then begins to crystallize. This has a lot to do with how you store you honey. If you store your honey above 60 degrees Fahrenheit (or in a certain containers the optimum is 57 to 58 degrees) it will crystallize. Levulose and dextrose levels affect crystallization also, so typically the one with the higher dextrose will crystallize more quickly; for example, Clover and Alfalfa crystallize more quickly than Orange Blossom or Blackberry. Also larger quantities will crystallize if they are stored on a concrete floor and the cold temperatures are drawn up into the container. If the honey re-crystallizes very quickly it only means that the honey did not get properly liquefied which means that the sugar crystals did not get dissolved. So if you need to repeat the process, bring a pot of water to full rolling boil, and then take pot off of the heat, and then place your honey container in the pan of water, this may need to be repeated a few times in order to completely dissolve all the crystals otherwise it will re-crystallize within just a few days.